Commission your own painting of a pet or a loved one. Every painting is completed with great attention to detail making sure you get not only the best likeness to the subject, but a stunning painting your family will treasure forever. I use high quality archival materials ensuring that your painting will last for many lifetimes. Working from single or multiple photographs I can guide you through the process making sure you get exactly what you want. If you are local to me you may be able to avail of the free photography session offered to get the best possible photographs to work from. Otherwise I’m happy to work from the client’s photos providing they are good quality. You can get some tips on taking photos suitable for painting in the tabs below. Gift vouchers are available to purchase for any amount towards a portrait making it the perfect gift at short notice. This way the recipient is able to be involved in the planning stages of their artwork and witness it come together in the progress shots. I’ve had it said many times that the best and unexpected bonus of having a commission done, was getting to see it progress. That is a side of my work I love to share! Paintings can be posted unframed worldwide. If you live in Northern Ireland you are invited to pick your painting up from my wonderful framer at Art & Home in Holywood framed and ready to hang. A large choice of frames are available and this is best arranged with the framer. Please have a read through the tabs below for more information on my simple commission process. Additional Subjects Add 50% for each additional subject Add 50% for each additional subject. The above are guide prices based on typical portraits of this size, however I can work in any dimensions up to 40”x28”. There may be an extra charge for complex backgrounds. I try to reflect the time I spend and cost of the high quality materials I use in my work. Each piece is done with perfection in mind however many hours that takes. As it’s difficult to estimate the cost for a landscape commission please get in touch to discuss what you have in mind or e mail photos to info@emmacolbertart.com. It couldn’t be easier to commission your own piece of art. Once you have decided on a size and how much of the subject/subjects you want painted it’s simple to arrange your portrait. If you are unsure of size and background colour etc I can advise you on this. Waiting times can vary depending on work load – an approximate completion date will be given at time of ordering. Shorter deadlines for special dates can sometimes be met but on average my waiting list is around 7 months long. Christmas orders should be booked as early as possible to avoid disappointment. Finished pastel paintings can be posted worldwide unframed. Clients in Northern Ireland can avail from my professional framer in Holywood who will guide you in choosing the perfect frame to finish off the painting. A pastel painting requires framing behind glass. 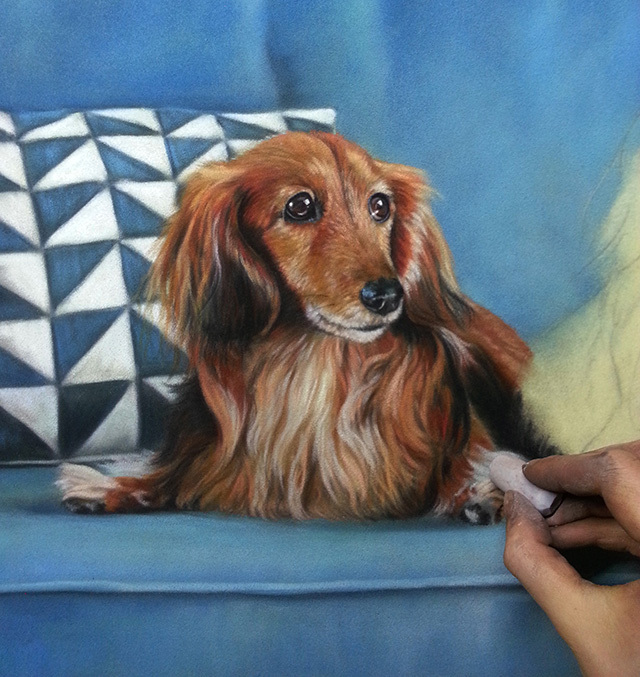 You can see some examples of framing methods at Framing a pastel on velour.Alternatively you can have the portrait posted to you and arrange your own framing. A deposit of at least 20% is required with every order. Balance is due on completion once you are happy with the online preview. Bank transfer, cheques and Paypal are accepted. Please make all cheques payable to ‘Emma Colbert’.